The free, ad-supported music streaming party is over, at least for Microsoft. 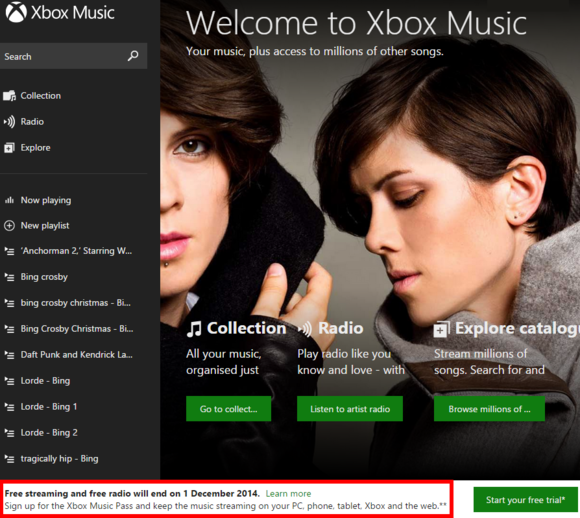 The company recently announced that effective December 1, Xbox Music’s free tier will be retired. Anyone who wants to use Xbox Music after that date will have to pony up for Xbox Music Pass, the company’s $10 per month subscription offering. The impact on you at home: For Xbox Music listeners, it means you won’t be able to stream music for free anymore via the built-in Music app in Windows 8.1. If you purchased music from Microsoft’s Xbox Music storefront those tracks will still be available across your devices, and since they’re DRM-free you can even take them with you to another service or app. Playlists, collections, and radio stations will cease to work without a Music Pass subscription. You can still view your created playlists inside Microsoft’s apps and the web version—you just can’t listen to them without paying for a monthly subscription. A notice on the Xbox Music Web app notifying users of the end of the free, ad-supported streaming tier. With services like Spotify that seem to only expand their free, ad-supported streaming services, why would Microsoft dump its free tier? Officially, Microsoft says it is giving up on free streaming so it can make Xbox Music “the ultimate music purchase and subscription service experience,” according to a company FAQ. But it’s notable that companies like Pandora and Spotify, two leaders of the free streaming trend, are continually losing money. Both companies boosted their earnings in 2013, but still lost money, as The Motley Fool reported in May. The culprit? The royalty set-up where streaming companies end up paying more in royalties with every new customer (free or paid) that they take in. The hope is that if enough customers convert from free to paid accounts that streaming services will get ahead of their royalty payments and turn a profit in the end. There seems to be some doubt about that rosy optimism for the future of streaming, however. So perhaps Microsoft hopes that by going strictly with a paid version it can avoid the losses that other streaming services experience. 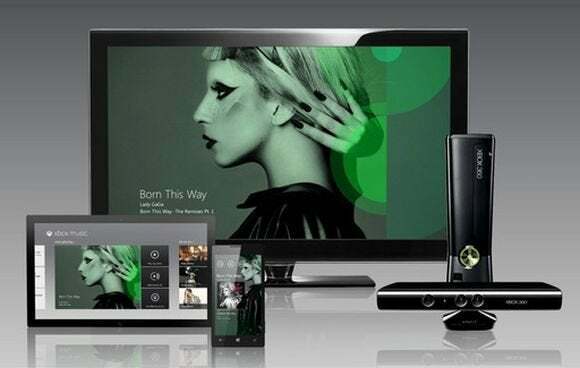 Another possibility is that Microsoft doesn’t want to “devalue” the Xbox Music brand. Apple-owned Beats Music takes a similar approach by advertising its streaming service as so good, you’ll want to pay for it. Google’s streaming service Play Music All Access also doesn’t offer a free tier. If Microsoft’s decision to dump its free streaming service has you down, there are many alternatives out there to replace it. The most obvious choice would be Spotify, which offers both paid and free, ad-supported music streaming. There are some limitations with Spotify’s free tier on mobile, but for anyone listening from a PC Spotify is a solid choice. Spotify competitor Rdio offers a similar free, ad-supported service. And if you don’t mind having your tracks chosen for you, there’s always the original Internet Radio service, Pandora. The one thing you won’t get with these other services, however, is the one stop shop that Xbox Music is. Since its initial roll out in 2012, Xbox Music has become a place to house your personal music, buy tracks, and stream music you didn’t own. Google Play Music offers a similar approach as a cloud-based music storage locker, streaming service (All Access), and retail storefront. For now, if you want the one-stop shop approach you’ll have to pay for it. Both Play Music and Xbox Music offer 30-day free trials and charge $10 per month after that. This story, "More Beats than Spotify: Microsoft to kill free Xbox Music streaming" was originally published by PCWorld.